Are you looking for a shaved ice syrup that isn't quite as sour as some of the other berry flavors? Check our Hawaiian Shaved Ice�s blue raspberry snow cone flavored syrup. This berry flavoring allows you to enjoy that fruity taste that we all love without the tar flavor that you may not enjoy as much. 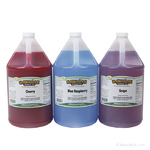 Don�t let your fear of sour berries stop you from enjoying a delicious snow cone! Your taste buds will thank you, we promise. This blue snow cone syrup is the perfect shaved ice flavor for kids who might not like sour sno cones. 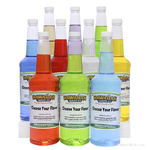 Have options that everyone can enjoy at your next party or family gathering! 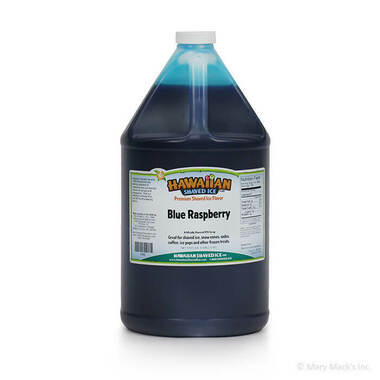 Buy our blue raspberry Hawaiian Shaved Ice flavoring today in the gallon size. 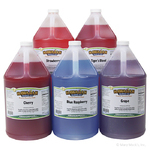 We also sell this flavor in quart and assorted packages, so that you can enjoy all of your favorite flavors!